Comprising of the Macao Peninsula, Taipa and Coloane islands, Macao is a Special Administrative Region since China resumed its sovereignty from the Portuguese Government on December 20, 1999. 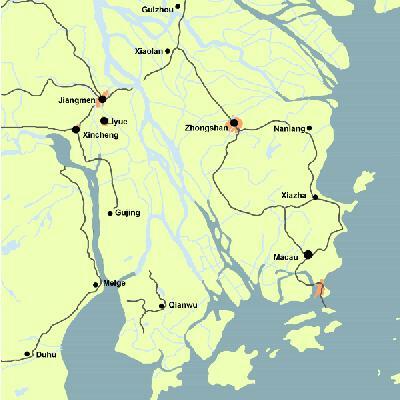 Macao is situated at the sea coast of southeastern part of China to the west bank of the Pearl River Delta, surrounded by sea from three sides, linking the Zhuhai Economic Special Zone in the north of Guangdong Province, facing Hong Kong in the east with a distance of 40 nautical miles only an hour flight by hovercraft. Macao's total population is 440,000 as of 2000, among which over 96% are Chinese and the rest are mainly Portuguese. The language the Macao inhabitants use daily is mainly Cantonese and the locally born Portuguese can speak fluent Cantonese. The official languages currently in use are the Portuguese and the Chinese languages. English is also used on many occasions. Macao is the China's territory since ancient times. During the Ming Dynasty (1368-1644), it was called Haojing, Haojiang, Haijing and Jinghu in succession, but later was occupied by the Portuguese. Macao is a free port. It pursues an open economic policy and has a highly export-oriented economy. It has a prosperous economy featuring four pillar sectors: tourism & gambling, export processing (mainly textiles and garments), banking, and construction & real estate. Macao was the name given by the Portuguese. In the mid 16th century, with the expansion of "the great discovery of navigation" by the European colonialists, the Portuguese using "drying of goods soaked in the water" as a pretext, gained the right of inhabitancy on the already open-for-trade Macao Peninsula through offering bribes to the officials of the Ming Dynasty and rapidly expanded territory under their control, and step by step occupied Macao, thus exercising colonialist control over Macao. None of previous Chinese governments had ever recognized the illegal occupation of Macao by Portugal. In 1979, China and Portugal established diplomatic relations and the Portuguese side affirmed that Macao is Chinese territory under Portuguese administration. On December 20, 1999, China restored its exercise of sovereignty over Macao and thus Macao has returned to the embrace of the motherland. Macao has a long history with a rich and varied culture. The Macao Government and people attach great importance to the preservation and development of Macao culture imbued with the feature of Sino-European cultures. Macao also plays an important role in advancing regional cooperation. It has special historical, trade and cultural ties with the European Community. The European Consulting Center jointly set up by Macao and the European Community in 1992 has been actively involved in promoting economic relations among Macao, the mainland of China and the EC countries. Macao's export processing industry is highly developed, with 104 trading partners, mainly the US, Germany, France, Briton and Hong Kong. Tourism is the mainstay of Macao's economy, with many other related industries, such as hotel, gem, curio, transportation, and entertainment, etc. Known as the Monte Carlo of the Orient, Macao attracts millions of tourists from around the world and particularly the Asia-Pacific Region. Macao is also listed by the World Bank as one of the developed counties and areas with high income per capita.